White, Paper Glassine Lined Bags, 5-3/4" x 7-1/2"
White, Paper Glassine Lined Bags, 4-3/4" x 6-3/4"
Black, Paper Glassine Lined Bags, 4-3/4" x 6-3/4"
Sky Blue, Paper Glassine Lined Bags, 4-3/4" x 6-3/4"
Sunbrite, Paper Glassine Lined Bags, 4-3/4" x 6-3/4"
Petal Pink, Paper Glassine Lined Bags, 4-3/4" x 6-3/4"
Cream, Paper Glassine Lined Bags, 4-3/4" x 6-3/4"
Wild Rose, Paper Glassine Lined Bags, 4-3/4" x 6-3/4"
Sky Blue, Paper Glassine Lined Bags, 5-3/4" x 7-1/2"
Sunbrite, Paper Glassine Lined Bags, 5-3/4" x 7-1/2"
Petal Pink, Paper Glassine Lined Bags, 5-3/4" x 7-1/2"
Black, Paper Glassine Lined Bags, 5-3/4" x 7-1/2"
Cream, Paper Glassine Lined Bags, 5-3/4" x 7-1/2"
Wild Rose, Paper Glassine Lined Bags, 5-3/4" x 7-1/2"
White, Paper Glassine Lined Bags, 6-3/4" x 9-1/4"
Sky Blue, Paper Glassine Lined Bags, 6-3/4" x 9-1/4"
Sunbrite, Paper Glassine Lined Bags, 6-3/4" x 9-1/4"
Petal Pink, Paper Glassine Lined Bags, 6-3/4" x 9-1/4"
Black, Paper Glassine Lined Bags, 6-3/4" x 9-1/4"
Cream, Paper Glassine Lined Bags, 6-3/4" x 9-1/4"
Wild Rose, Paper Glassine Lined Bags, 6-3/4" x 9-1/4"
Glassine lined bags provide a barrier against grease, stains, and moisture. Use these for baked goods, greasy foods or any messy item. Ideal for fast food restaurants and bakeries. 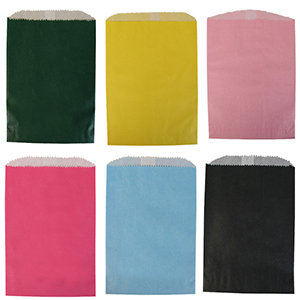 These glassine lined bags come in 8 different colors and 3 sizes. All Glassine bags are FDA acceptable for food contact. Glassine Bags are packaged in a case of 1000. If you don't see exactly what you need, call us at American Retail Supply 1-800-426-5708 to speak with one of our product experts.